In this episode, Robert and I discuss what the IAB got right — and wrong — about its latest research on advertising growth. 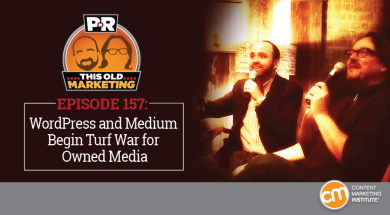 We also explore signs that WordPress and Medium are ready to battle for website turf and proof that blogs are getting longer and taking longer to write. Our rants and raves include an immersive live storytelling-and-performance mash-up and theories about the impending downfall of the press, then we wrap up with a gorgeous example of the week from Autodesk. Ad revenues for the first half of 2016 hit an all-time high (15:48): Digital advertising revenues in the United States grew 19%, year-over-year, scaling to $32.7 billion, according to the latest report released by the Interactive Advertising Bureau (IAB) and PwC US. While these results are encouraging, if you go further into the numbers, you’ll see that the growth is primarily being driven by just two companies, and that some of the stats might not be adding up correctly. Why WordPress isn’t scared of Facebook, Snapchat, or the future of publishing (22:55): Despite the increasing dominance of mobile and social media (as evidenced in the research cited above), the content management tech company remains bullish on the role websites will play in the publishing game. In an interview on Contently, Editor Mark Armstrong contends that publishers will want to pursue social platforms in the future, but won’t be willing to cede full control of their audience — or their content. I explain some of my own top-line reasons why websites aren’t going anywhere, but I concede that a really interesting media battle may be brewing. New research reveals top blogging trends (33:00): In its third-annual survey, in which it queried more than 1,000 bloggers, Orbit Media finds evidence that blog posts are getting longer, are taking more time to produce, and are increasingly being supported with email and paid media techniques. While we are excited about everything found in this report, Robert and I are particularly encouraged by signs of an increased commitment to producing high-quality, long-form blogging efforts throughout our industry. Curalate: The millennial mindset: Visual marketing tips for fashion & beauty retailers. Inspiring millennial consumers to take action. Research shows that 42% of millennial shoppers check at least four sources when deciding on a purchase, so there’s no downplaying the impact that social, mobile, and digital channels of communication have had on the fashion and beauty industries. It’s profound — especially among millennials. This guide teaches you how to tailor your content for six style-savvy millennial personas, how to leverage experience-driven content from influencers and fans to excite and inspire these influential shoppers, and how to monetize your visual content on the channels and touchpoints that matter to your brand. Download it now. Robert’s short rant: In a recent email newsletter article Robert received from BoSacks, the long-time media insider put out a call for opinions on whether media and advertising still matter as a means of persuasion, given how little an impact high-profile media endorsements and campaign ad spending seemed to have had on the recent U.S. election. In Robert’s view, the key to making media matter is to take a strong point of view. Love it or hate it, the winning candidate wasn’t afraid to conduct passionate, polarizing conversations, which drowned out all other media messages and spurred people to take action. Robert’s short rave: The Boston Globe recently introduced Robert to an innovative content-and-performance mash-up known as “pop-up magazines.” Though there’s no unifying format for these immersive live storytelling events — which combine music, theatrical performances, and current events, and culminate in an after-party where the performers encourage attendees to join the conversation — they all share the fundamental aim of gathering people together to share true stories. Joe’s rant: As a board member, I recently attended the Cleveland Press Club’s Hall of Fame induction ceremony. In his acceptance speech, one of this year’s honorees, Michael McIntyre, spoke of his concerns that the current business model may not be able to support the media business for much longer. While I am optimistic that a more viable model will emerge, I do see a prime opportunity for marketers to pick up the slack in areas in which traditional media can no longer afford to invest. NewsCred recently highlighted some remarkable content coming from our friends at software company Autodesk, including its stunning new blog, Redshift. After the company’s original stand-alone blog Line//Shape//Space grew too successful to continue to scale, Dusty DiMercurio, the company’s head of content marketing and strategy, recognized the need to evolve the original vision and expand its scope beyond serving what he calls VSB’s (aka very small businesses). Launched this past September, Redshift’s content reflects the company’s shifted editorial charter — which includes providing innovative ways for customers to personalize how they experience Autodesk content. For example, as the NewsCred profile describes, registered visitors can choose to follow particular authors and content categories, and new site technology will serve them customized content selections based on the actions they take while exploring the site. What Robert loves most is how Autodesk started small and generated value, then iterated and evolved its content — just as it would do with any other branded product it offered to customers. Not only does this make it more likely that Redshift will stand the test of time, it makes it a phenomenal example of This Old (and new) Marketing.